Love comfort food but can't make it fit your meal plan? Here's 2 macro friendly recipes to solve that problem. First of all, finding macro friendly recipes for the foods we love can feel like a thankless task. It seems like you spend hours searching for that perfect recipe only to find that it's got 60g of fat or 100g of carbs per portion, which totally blows out your macros for the day. As a result, you do a complete 180 degree about turn and swap great tasting food for plain, dull, and generally uninspiring meals, just because it's a hell of a lot easier to fit in your meal plan. But every morsel you end up putting in your mouth is met with a high degree of disappointment and you ask yourself, "do I really have to eat boiled chicken and rice for the rest of my life?" And you'll be glad to know the answer to that question is a resounding NO! Almost you're entire Instagram feed is probably filled with a million pictures of shredded guys and girls eating chicken, broccoli, and brown rice out of Tupperware in the run up to their shows and competitions, but it need not be the way for 99.99% of the population. And you are in that 99.99%! 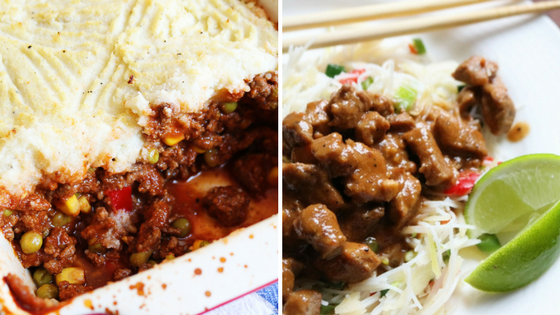 So in this week's edition of Meal Prep Sunday, I've got 2 more great dishes for you that fit the brief of being tasty and good on the macros. And there's not a piece of chicken or grain of rice in sight, you'll be glad to hear. I've picked these dishes because one is well suited to a lower carb/higher fat plan and the other suited to a more traditional balance across​ the three macros. So there really is something for everyone. And this is proper comfort food, no sacrifice of flavour here. They're the type of dishes that give you that full feeling and make you feel satisfied and content when you put that fork down. These recipes will give you that warm and fuzzy feeling as well as helping you make some serious gains! Start off by heating the oven to 400F (200C). After that, prepare the cauliflower puree by steaming or boiling the cauliflower along with the garlic. Once soft puree both garlic and cauliflower with a hand blender and mix in the butter. Season to taste with salt and pepper. In the meantime, heat a large, dry non-stick pan and fry the lamb for about 5 min. until browned, then get rid of excess fat. Add in the frozen vegetables, tomato puree, Worcestershire sauce and fry for another 5 min. Pour in the beef stock and add in the seasoning, bring to a simmer and cook for about 10 min. First of all, cook the noodles according to instructions on packaging. Heat half the oil in a wok and fry the Chinese vegetables for 8 min. Meanwhile, season the pork with sale and pepper. Heat the remaining oil in a frying pan and fry the meat over medium heat for 8 min. until golden brown. Meanwhile, mix the peanut butter, honey, soy sauce and lime juice with water in a saucepan and bring to a boil. Turn the heat to low and cook for 4 minutes. Add the sauce to the meat and toss. Add the cooked noodles to the vegetables and toss well. Serve the noodles topped with the satay sauce and a wedge of lime. So there you have it. A couple of great macro friendly recipes for you to work into your meal plan for some much needed taste and variety. Even with these macro friendly recipes, are you confused about how to plan your meals effectively? Confused by terms like macros, flexible dieting, refeed days, and the like? And the solution you need is only a click away. All you need to do is click the image below and register for my FREE '7 Steps to Get Lean' Online Nutrition Workshop. Then, once you're registered, make a note of the date and time in your calendar, because you won't want to miss this. Not only will you learn all about calories and macros, but you'll also discover the exact approach I use for both my own and my client's programmes. It's the game changer you need for your fitness!